We recently came across Mascot Workwear and were somewhat taken aback that we had not seen this company before. However, it transpires that we had in fact seen some of their products on our travels and not realised it. They are one of the leading brands of workwear in Europe and the market leader within Denmark, with a European-wide distribution network. They produce items of clothing for workwear and safety wear for both everyday and specialised usage literally from head to foot. The vast range of products - over 17,000 - covers items for industrial, public sector and tradespeople of all types. Their online catalogue is some 234 pages and this attests to the sheer variety of what they can offer. 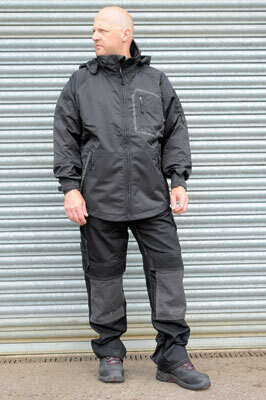 Mascot Workwear are very conscious of the styling and how their clothing fits people as well as being fit for purpose. We are seeing a lot of workwear companies concentrate more on the styling than they ever have, knowing full well that people will not only use the items for work; many of the designs are made to not look out of place in day-to-day use. This certainly applies to some of the items we tried out. 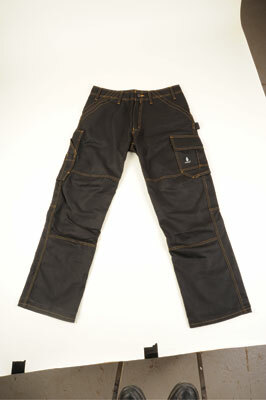 The materials used in the manufacture of their goods are based on the product's needs and will incorporate the best, latest and most suitable products, whether it needs to be heat/fire resistant, breathable, waterproof, have reinforced elbow or knee areas, adjustments made for when flexing your body, a range of colour options - the list goes on. Their products are tested to the extreme to make sure they will not let you down. 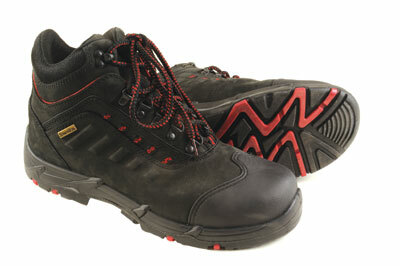 We had a delivery of some items including some jackets, trousers and safety footwear and tried them out. These are on long-term test so we can report periodically as to how they fare over time. 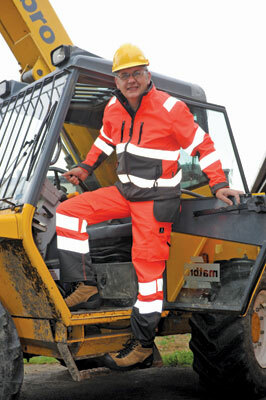 For site work it may be necessary to wear bright clothing with reflective stripping. Mike tried out the Britello jacket and trouser combo, and reckoned the fit was great and they were comfortable - and he certainly wasn't able to sneak up on us easily! He commented that they had enough give and movement in them and were not restrictive when bending, moving and working. There are plenty of pockets of a reasonable size, so you can fit your hands in to warm up on a cold day. The zips were easy to use too - this may seem a petty thing to pick up on, but not all zips are made equal! How many times have you fiddled and faffed trying to get one to go together? Other colour options for these hi-vis products are available. The safety boots - Pumori - fitted well and were very comfortable straight out of the box; no pinch points when flexing, bending or walking. We actually found this with all the safety footwear we were sent. They have generous amounts of room and the modified front toe-cap has a section curved out so your toes can move easily and the edge of the cap won't pinch the toes when flexing the front of the boot. There is also a nice amount of cushioning in the heel section which makes walking very comfortable and likely not to cause much fatigue during a hard day's work. 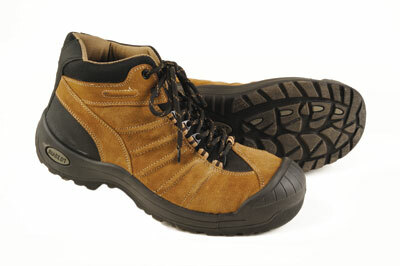 The many different types of safety footwear have different detailing, styling and colours. The Bancroft jacket is a case in point about excellent styling and functionality combined. It is a breathable wind-and-waterproof jacket that not only looks smart but is very comfortable to use. There is plenty of room to move without it looking baggy and the back section is extended to cover the backside better when bending down - often not found on many jackets and a real problem with water if not present, as jackets ride up at the back and water runs down the belt line of the trousersâ€¦ arghh! The Lerida trousers are an excellent fit - the sizes requested according to the extensive list and measurement chart Mascot has are spot on. The Kevlar-reinforced knee sections are exactly in the right place when kneeling - not always the case with some manufacturers. This area is subtle so it does not tighten across the knees causing undue pressure. The Murcia jacket once again shows the styling and also perfect functionality. The jacket is breathable, and wind-and-water resistant. There are large pockets, ideal for keeping hands warm and dry when raining and again it has the elongated back lower section to cover the backside better. Superb work wear and excellent for everyday use, too. Mike tried out the Tarragona top and found this to be equally as comfortable as the ones I tried, but this one is not only breathable, windproof and waterproof - made with Mascotex with taped seams, it is able to withstand even more harsh weather. 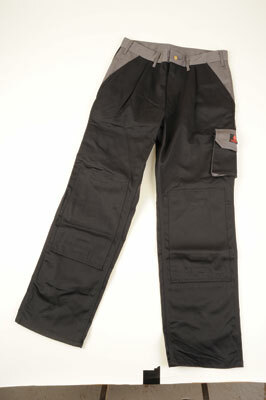 Plenty of pockets, easy to move in and going to withstand a serious amount of rough and tumble. We looked at more items, suffice to say we could not fault them, they were true to their measurements, moved in the right places, looked good - we are all vain sometimes, even when getting covered in dust and debris - and the prices are very competitive, too. We will keep you up to date with our long term tests. If you were not aware of this brand, look them up. We are sure you will be able to find just what you are after.